(Newser) – If you were hoping to become a chess master by practicing 10,000 hours, think again. Contrary to the theory that expertise at chess is based on intensive training, researchers at the University of Michigan have concluded based on a meta-analysis of 19 studies that hard work is important but not enough. In this game, if you're not smart, you're probably sunk. "When it comes to expertise, training and practice certainly are a piece of the puzzle," psychology professor Zach Hambrick says. 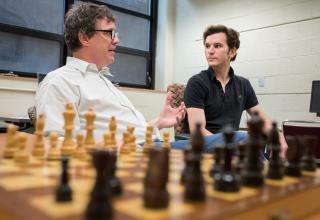 "But this study shows that, for chess at least, intelligence is another piece of the puzzle." Well, that explains why I win all the time. I always heard that you don't win just because you don't want it enough. Studying makes you smart. Not studying makes you not smart.